Why not buy a set of Lunchbox Love for Love Ones for Mother's Day or Father's Day? You can leave your sweetie a note on his/her pillow, stuck to the mirror in the bathroom or sneak it into his/her lunchbox. 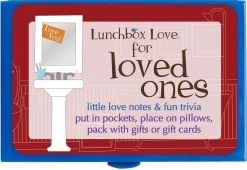 Cost: One set (12 cards) of Lunchbox Love for Loved Ones is $3.99 + shipping ($$$). Overall: We give Lunchbox Love for Loved Ones a 10/10! One lucky reader will win a set of Lunchbox Love for Loved Ones cards! And if you don't win (or even if you do), you can use the promo code featured above for 10% off of an order, and you also get free shipping on orders of 4 or more volumes of Lunchbox Love. First, visit the Lunchbox Love website. Then, comment here and tell me about which set of cards you'd love to own. 5) Become a fan of Lunchbox Love on Facebook. This giveaway will close on May 8, 2011 at midnight. We received a set of Lunchbox Love for Loved Ones cards free of charge for the sole purpose of this review; no other compensation was received. All opinions expressed are my own. id like to get the teens & tweens lunchbox for love cards! i have 5 daugters from 8 - 18, these would be perfect! i like the twinners on facebook! entered b kind 2 earth day giveaway! I would love the Lunchbox Love for Kids cards! Entered Bausch & Lomb giveaway! I want a set of Lunchbox Love for Loved Ones - I liked them the best! I am a fan of Lunchbox Love on Facebook. i'd love to get the ones for kids!